What is a Solar Cooker? Using the sun's energy to cook may sound like something out of a science-fiction film but it's not. Solar ovens exist in the here and now, and not just as a scientific curiosity. Large scale solar cookers, such as the bowl at Auroville in India, are used to prepare food for a thousand people at once. There are thought to be hundreds of thousands of small scale solar cookers in China, used by families every day. A solar oven is a device that captures the energy of sunlight and turns it into heat, which is used to cook food. 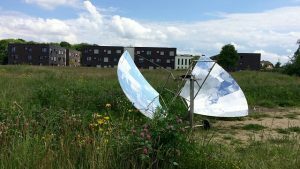 Solar ovens can be relatively low technology devices, if you fancy having a go at making your own you'll find numerous designs on the web you can follow. A mirrored surface is used to refract and concentrate sunlight into a small area. The shape of this surface and the materials it's made of will affect how much the power of the sunlight is magnified. Light is concentrated into a receiver, a cooking pan or pot. In order for the light energy to be converted into heat efficiently, the pan needs to be made of a material that retains and conducts heat. Pans and pots used for solar cooking are always matt black in colour. The air inside the cooker needs to be isolated from the outside, to minimise heat loss from convention. Putting a glass lid on the top of the pot increases light absorption. Glass produces a greenhouse effect (which is why it's used in... greenhouses!) allowing light through, but preventing the release of infrared heat radiation. The sides of the cooker need to be well insulated to retain the generated heat. Typically, solar cookers are designed to achieve temperatures between 65°C and 400°C, so they can be used for anything from baking to frying and grilling. It's not necessary to turn or stir food in a solar oven, in fact it's best to keep the cooker closed to prevent heat escaping. The cooker will work most efficiently if it faces the sun directly, some advanced models are even designed to rotate as the sun moves round. How solar ovens work depends on the strength of the sun, the latitude at which they're being use,d and the local air temperature. Solar cookers are always more efficient in the two hours around noon rather than in the morning or evening. The speed of cooking also depends on the type of cooker being used. A small solar panel type cooker might typically take around two hours to bake your biscuits or cakes. A parabolic cooker could produce high enough temperatures to cook a steak in a few minutes. Solar ovens use no fuel, so they save you money! 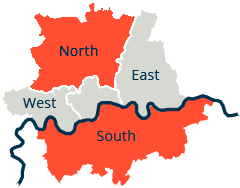 No open flame is required so they're safe to use in areas where there's a risk of fire. There are environmental benefits also. Sunlight is infinitely renewable, something that can't be said of gas, electricity generated by burning solid fuels, or even wood, coal or charcoal burners. Clearly the most obvious downside to a solar cooker is that it will only work outdoors, when the sun is shining. 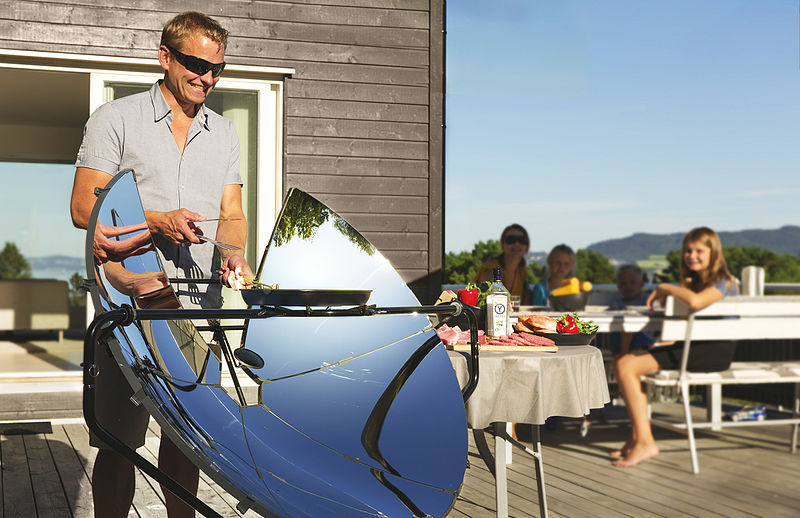 This rather limits their use in the UK where the climate is unpredictable and many people don't have outdoor space available to set up a solar oven. That's not to say that UK customers can't take advantage of free energy from the sun to reduce their cooking costs. Installing photo-voltaic cells on your roof and either using the power generated by them directly, or selling it back to the grid is likely to generate enough savings to pay for your conventional electric cooker repair and maintenance.